Specific: Write down in detail what you are striving for and what it will look like when you achieve it. Measurable: Document how you will know when you’ve achieved the goal, and the subgoals along the way. Achievable: Create a step-by-step plan of how you will work toward the goal. Realistic: Be honest with yourself. Can you really reach this goal? Time-framed: Make a timeline. Put intermediate steps and daily activities in your calendar. One goal at a time is all you need to impact your quality of life. 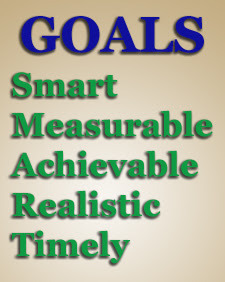 Just be sure it’s a SMART goal.